Map It! 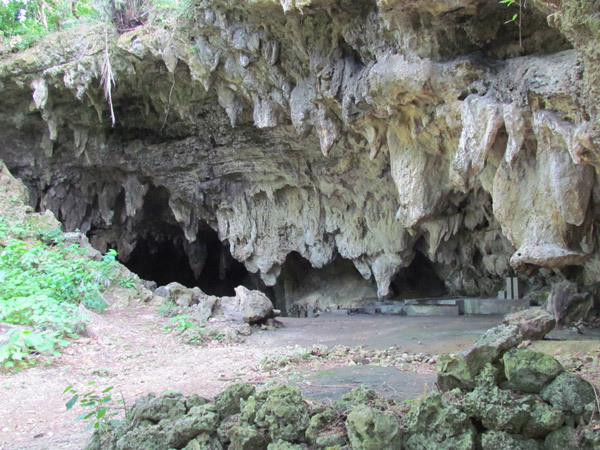 Okinawa: "The Yabuchi Cave Ruins"
In 1959, an important archaeological discovery was made near the Katsuren Peninsula, off a small Okinawan island called Yabuchi Jima, or Yabuchi Island. An information sign provided by the Uruma City Board of Education explains that it was here that four archeologist named Masahide Takemoto, Seitoku Hokama, Shoichi Heshiki, and Koutoku Miyagi first made the discovery of old ruins at this location. A year later, an excavation team, headed by Naoichi Kokubu, would later find old pottery and shell arrowheads estimated at the time to be 6500 years old. Shell arrows found here were similar to those found in Southern China giving belief that sea routes were a lot more extensive than previous realized. 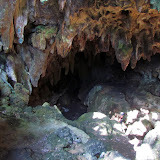 The cave is known historical site. There is an information sign translated in English, Chinese, and Korean. Visitors are welcome. There is even a guest sign book station near the cave. The Yabuchi cave (also called Janei Gama ジャネイ ガマ by the Okinawans) is also a place of worship. You may see some Okinawans come and pray. There are different areas where certains spirits are prayed to. Please show proper reverence around the area. As a rule of thumb, if you do see Okinawans praying, it is best to keep a proper distance for privacy's sake. This goes with all sacred sites or places of worships. Okinawans are accustom to curious foreigners and welcome cultural appreciation, but as another rule of thumb, please avoid taking any pictures of them praying unless they give you express permission. I gather most may not mind, but some prefer privacy. Getting there. Getting there is a literally a straight shot, as you can see from the map. HOWEVER, once you pass the Yabuchi Bridge the road becomes a dirt road. THIS IS VERY NARROW DIRT ROAD and only one car can go through at a time. At times you will be wall-to-wall against vegetation. Plus, there are farmlands along the way, and chances of running into a farmer's vehicle is very likely. There are certain areas where your vehicle can turn off and let the other vehicle pass. I DO NOT RECOMMEND driving through with a large SUV or truck. Use proper judgement. But you at least have two options for parking (see next paragraph). Parking. There is limited parking at the end of the dirt road near the cave grounds. There is plenty of open space to turn your vehicle around. You can park here if you have a small to medium size vehicle. The other option for parking is where the paved road becomes a dirt road. You can park here and walk about 1.5 Kilometers to the cave grounds. It's up to you. You will be far away from your vehicle so park at your own risk. Safety. The cave can get pitch black after a certain point and the ceiling becomes smaller and smaller with stalactites-icicles forming from the top. It does come to a dead end. Watch your head. Depending on the time of year, you may see lots of mosquitoes, so be prepared. Other places of interest nearby: The Yakena Straits Observatory. Steven that is good information thank you. I did not stumble upon that myself. Will have to go back and take a look. Thanks again for sharing!! !